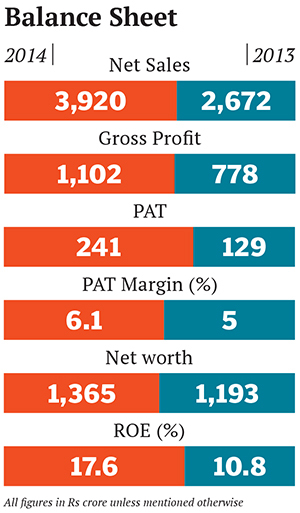 Can Deepak Fertilisers Step on the Gas? In April, Sailesh Mehta was ready to conquer the world. Financial year 2014 had been among the best for Deepak Fertilisers & Petrochemicals Corporation Limited (DFPCL) with revenues growing 46 percent to Rs 3,920 crore and net profits touching Rs 250 crore, up by 90 percent. Armed with these numbers, he had launched a takeover bid on the Rs 3,310-crore Mangalore Chemicals and Fertilizers (MCF) in April 2014, a company in which DFPCL was already a stakeholder with 25.3 percent. They now made an open offer to acquire 26 percent more for a majority stake of 51 percent, at Rs 63 per share. The company, Mehta felt, had natural synergies with DFPCL in terms of product profile (urea-based fertilisers which Deepak did not have) and geography (stronghold in Karnataka). But within a few weeks, DFPCL found itself challenged on two fronts. One, a rival combine of the Adventz Group-owned Zuari Agro (which had a 16.43 percent stake in MCF) and Vijay Mallya, the controlling stakeholder with 22 percent, had entered the ring with a higher offer at Rs 68.55. Two, on May 15, the government had cut the natural gas connection to DFPCL. With gas supplies shrinking in the domestic market, the government wanted to divert available supplies to urea manufacturing companies, which produce subsidised fertiliser. The move led to huge cost overruns for Deepak Fertilisers. But the Mehta Forbes India met was optimistic. “I see a long journey ahead for Deepak Fertilisers. Many people feel that I have woken up suddenly and become a very aggressive businessman. That is not the case. As you focus on a key area, you start to see a clear path. We expect to get over our immediate problems but our eye is clearly on the big picture,” Mehta said on June 4, during an interview in his Pune office. This “big picture” is to look beyond fertilisers, which are intrinsically linked to about-to-explode domestic gas prices. The UPA government had announced a doubling of gas prices from $4.2 per mmBtu (million metric British thermal units) to $8.4. Even though the new government is taking a relook at the pricing, one thing is clear: Gas prices will be higher than before. 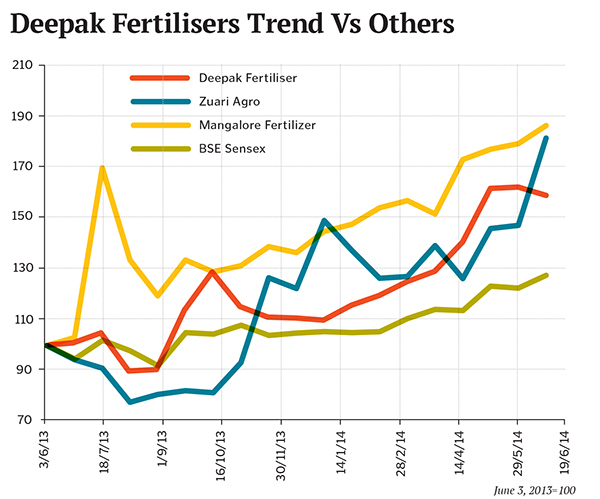 Currently, a third of Deepak’s turnover is associated with fertilisers. The other two-thirds come from chemicals and technical ammonium nitrate (TAN). His plan, he explained, is to leverage on the buoyancy in both these segments in order to hedge himself against the problems related to the fertiliser business. Consider that the spurt in DFPCL’s growth had been boosted by an increase in demand for TAN (used as a blasting material for mining and explosives) and methanol (used by the pharma industry, for which international prices had shot up). These comprise the chemicals business which saw a growth of 49 percent against the 41 percent for the fertiliser business. Not surprisingly, over the last year, the stock has moved up by 60 percent as against the Sensex’s 30 percent. But that was in April 2014. Today, the immediate concern for Mehta is the bidding war he finds himself entangled in. Mallya’s ownership of MCF was “one of the biggest reasons to put a bid on MCF”, he says. “Dr Mallya has a controlling stake in the company but it is not his core business. The MCF business is a good fit for us in terms of geography and product profile.” That was why, in June 2013, DFPCL, which already owned 24.5 percent, raised its stake to 25.3 percent; in April 2014, it made its open offer. But it did not account for competition. Mehta had little choice but to hold back. “You are getting these businesses at a very low price in the stock market, where the market capitalisation of the company is lower than its sales. This is a rare thing for a company with the size of Deepak Fertilisers,” says Jayesh Parekh, an independent investor. The market capitalisation of DFPCL is at Rs 1,367 crore against its sales of Rs 3,920 crore. The business synergies with MCF are well-established but, according to an insider, the company also has a huge land bank of unconfirmed value and that seems to be an additional (and underplayed) point of interest for Deepak Fertilisers. But it is unlikely that Zuari Agro, which holds a significant stake in MCF, will relent easily. The company has been a long-term player in fertilisers. “The Adventz Group remains firmly focussed on the agriculture sector, a key area contributing vitally to the overall economic growth of the country,” the company told Forbes India in an email. There is strategic value for Zuari also because both companies operate in Karnataka and deal in similar products. If Zuari does win the bid, it will get to dominate the region and companies like DFPCL will find it difficult to compete. Zuari has also hit a purple patch over the last year, with the stock price going up by 75 percent —it was trading at Rs 187 as on June 13, at a market cap of around Rs 800 crore. However, though its revenue stood at Rs 7,400 crore for FY2014, it made losses to the tune of Rs 44 crore. What next is a pointed question for Mehta: Deepak Fertilisers may look to outbid Mallya-Poddar but since MCF’s stock price is already Rs 72, a higher counter offer will not be an easy call. Again, given that the controlling stake of the company might still stay with Mallya, Deepak Fertilisers may not be able to use MCF as a strategic acquisition. Mehta has time till June 30 to make another counter offer but, for the time being, he is investing his efforts in solving the gas supply crisis. Mehta’s fertiliser business is fraught with other problems too. At this point, since the natural gas supply has been cut off, DFPCL is unable to produce 1,000 tonnes of fertilisers every day. That is leading to a per tonne realisation loss of Rs 27,000. Besides, natural gas is used to manufacture ammonia, the raw material for nitrogen, phosphorus and potassic fertilisers. If it is unavailable, the company needs to shift to LNG (liquefied natural gas). LNG is an expensive substitute; as against $4.2 per mmBtu for domestic gas, imported LNG has a landed cost of around $14. For DFPCL, this means a total cost of Rs 100 crore annually, which could affect its net profit margins by over 10 percent. The matter is currently in court and the company is optimistic that a decision will be in its favour. The hearing is expected to be on July 1. The alternative is a downer. Consider that the immediate effect of the gas supply cut was a downgrading of the stock. Analysts who were earlier raving about the FY2014 results immediately reworked their high ratings of the stock. HDFC Securities, for instance, re-rated it to a “sell” fearing that the gas cut would significantly affect the margins. “I feel that the gas cut is very unfair to our company as there are others that are also manufacturing a similar kind of fertiliser. But since they are public sector undertakings, it is only us that the government is trying to target,” Mehta says. Realities such as these have forced Mehta and his team to ask fundamental questions about the business they are in—and the business they want to be in. “Among the things I am pushing for is to take Deepak Fertilisers beyond its commodity offerings,” he says. It won’t be the first time that Mehta will bring in change to the company, which was started as an ammonia manufacturer by his father CK Mehta in 1979. He joined the company in 1985 and immediately brought in end-to-end computerisation. Today, too, he is looking at an overhaul. While he plans to grow DFPCL inorganically through takeovers, there are changes that he is considering within the existing businesses too. On fertilisers, he is looking at a geographical spread as well as growth in product range. He also wants to make the business more consumer-facing, beyond the current commodity status. His idea is to provide customised solutions to farmers through his retail outlets under the brand name of Saarrthie, which has a presence in 12 locations. He plans to increase that to 18 this year and to 30 in the next three years. On TAN, the country’s security concerns have proven commercially advantageous for businesses like his. Earlier, India imported an unbagged form of the chemical, which was often pilfered. It turned out to be a huge security threat. The government introduced new rules in January 2014 stopping these imports. This has resulted in a massive jump in sales for DFPCL. TAN accounted for 21 percent of the company’s chemicals business in FY2014. The company is currently utilising 90 percent of its TAN producing capacity and is considering expansion in Odisha. For this product, Mehta has started to hire mining engineers instead of non-technical staff. The other arm of diversification has been in the business of malls. The rationale for this move, Mehta says, is to take advantage of the Pune real estate market (where he has set up Eshanya, a speciality mall for home decoration products, investing around Rs 260 crore in 2006). However, it has failed to produce returns and, for FY2014, it had an operating loss of Rs 21 crore. Mehta, though, continues to back this idea: He says that he has no plans of exiting this business. The investor community is closely watching Mehta’s big picture plans unfold. “Mehta is an enterprising manager with a keen interest in detail. 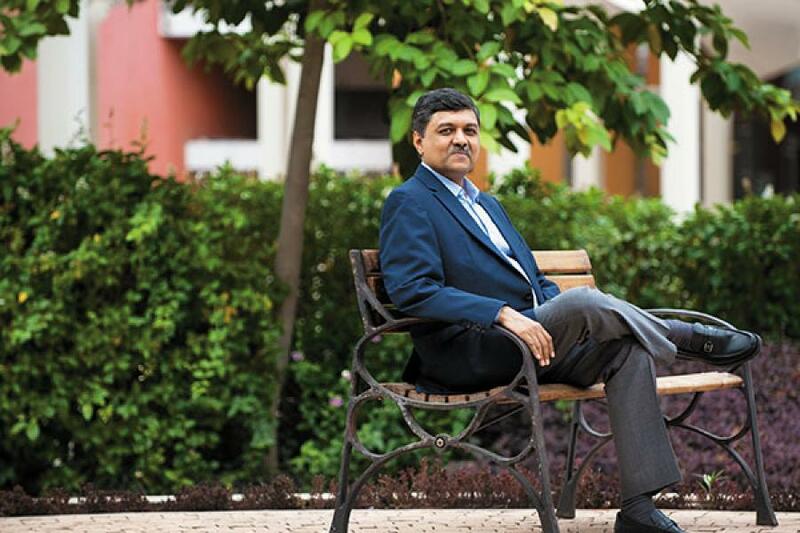 He’s very focussed on understanding business issues in detail and is thoughtfully deciding the strategy and approach to addressing them,” says Vishal Kampani, managing director and CEO of the Institutional Securities Group at JM Financial. The next few weeks will either dampen his spirits or underscore his optimism. Either way, it’s interesting times ahead for him and his company.